Starting in Android 7.0 (API level 24), you can display related notifications in a group (previously called "bundled" notifications). For example, if your app shows notifications for received emails, you should put all notifications into the same group so they can be collapsed together. To support older versions, you can also add a summary notification that appears alone to summarize all the separate notifications—this is often best done with the inbox-style notification. Note: Notification groups are not the same as notification channel groups. They are actionable, with actions specific to each notification. There is more information in each notification that the user should see. If your notifications don't meet the above criteria, you should instead consider updating an existing notification with new information or create a message-style notification to show multiple updates in the same conversation. 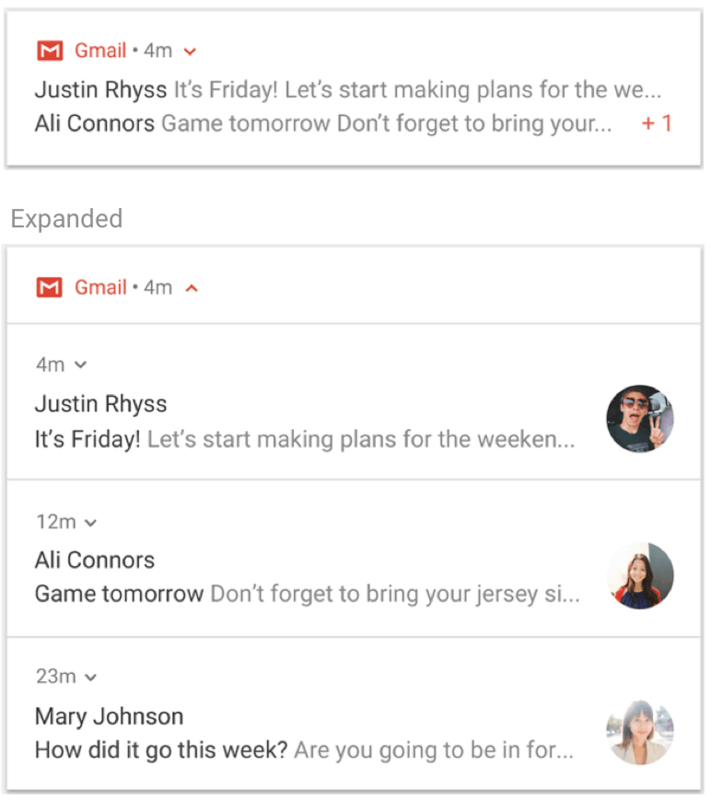 Note: If your app sends four or more notifications and does not specify a group, the system automatically groups them together on Android 7.0 and higher. By default, notifications are sorted according to when they were posted, but you can change order by calling setSortKey(). If alerts for a notification's group should be handled by a different notification, call setGroupAlertBehavior(). For example, if you want only the summary of your group to make noise, all children in the group should have the group alert behavior GROUP_ALERT_SUMMARY. The other options are GROUP_ALERT_ALL and GROUP_ALERT_CHILDREN. On Android 7.0 (API level 24) and higher, the system automatically builds a summary for your group using snippets of text from each notification. The user can expand this notification to see each separate notification, as shown in figure 1. To support older versions, which cannot show a nested group of notifications, you must create an extra notification that acts as the summary. This appears as the only notification and the system hides all the others. So this summary should include a snippet from all the other notifications, which the user can tap to open your app. Note: The behavior of the group summary may vary on some device types such as wearables. To ensure the best experience on all devices and versions, always include a group summary when you create a group. Create a new notification with a description of the group—often best done with the inbox-style notification. Add the summary notification to the group by calling setGroup(). Specify that it should be used as the group summary by calling setGroupSummary(true). The summary notification ID should stay the same so that it is only posted once, and so you can update it later if the summary information changes (subsequent additions to the group should result in updating the existing summary). For sample code that uses notifications, see the Android Notifications Sample.